With more and more travel essential gadgets require charging, it is little wonder that people are turning to portable battery packs to help fill the power gap when travelling. Be aware that not all battery packs are created equal in build, quality or price. And to make it easier for our buyers, we reviewed Xoopar Rechargeable PowerHouse. Take a quick look below so that you pick the right one for you. Function: What we loved about this product is that there is no need of flammable oil and is very simple, convenient and environment-friendly. It is featured with 26 SMD LED Bulbs and 1W LED Torch so you can get maximum brightness for doing some normal activities indoor and outdoor. It comes with the easy-to-use power button and you can charge your mobile phones and other devices using the USB port comes with it. Durability: This emergency lamp is designed to provide long-lasting durability so it's constructed by using quality materials so you no need to worry about the lifetime of the lantern. Portability: It features a lightweight design and is super easy to carry when hiking, camping, outages and other emergencies. Charging mode: DC charging. 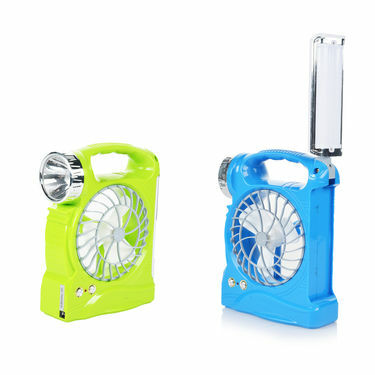 The battery capacity of the product is Lithium-ion 300 mAh, which takes 4-5 charging time and working time of Fan - 6 hrs, Torch - 10 hrs, Lamp - 10 hrs. 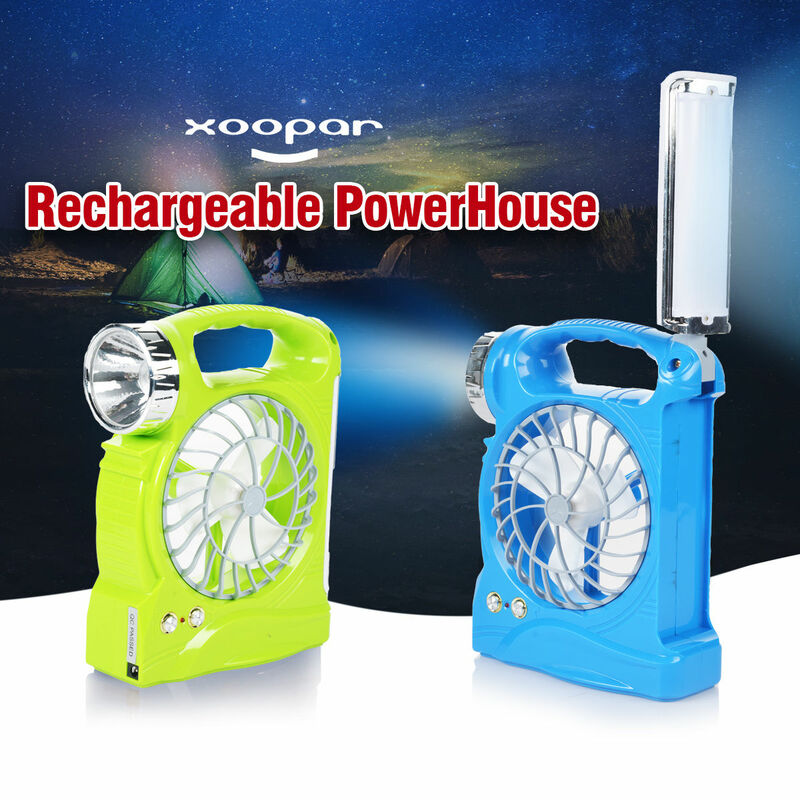 Definitely, using Xoopar Rechargeable PowerHouse will be a great way to get light during the night time in your camping tent. 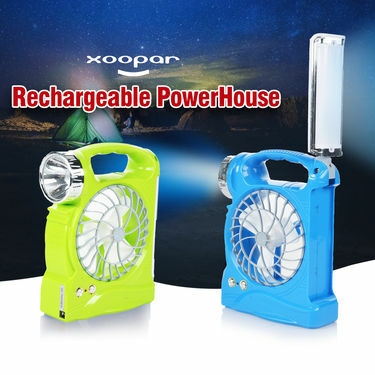 Moreover, you can also use this Power House for fishing, hiking, and other indoor/outdoor activities. I purchased this product as a gift and plan on buying one for myself as well. I like the rechargeable battery and the built-in power bank for charging my phone. Amazing. Better than I expected. Great to have in any kind of power outage. Thank you. Xoopar Rechargeable PowerHouseVSCombo of 3 Rechargeable Solar Lan.. Xoopar Rechargeable PowerHouse VS Combo of 3 Rechargeable Solar Lan..
Xoopar Rechargeable PowerHouseVSI Kall Solar Lantern + Portable C.. Xoopar Rechargeable PowerHouse VS I Kall Solar Lantern + Portable C..
Xoopar Rechargeable PowerHouseVSColorful Lights Solar Lantern (Bu.. Xoopar Rechargeable PowerHouse VS Colorful Lights Solar Lantern (Bu..